MeZeZe Social Phone Book is a Cydia tweak that can identify unrecognized phone numbers before answering a call. This allows you to actually see the name of the person, as well as additional information (if possible), of who’s calling you in real-time. This functionality is useful because you can easily identify whether you are getting a sales call or a call from your long lost friend. Note: The tweak requires you to sign up for an account upon downloading it and it does add an icon to your SpringBoard. If you are interested in the MeZeZe Social Phone Book app you can find it through the BigBoss repo for free. The WebOffline Cydia tweak allows you to download webpages to your iPhone, iPod Touch or iPad to view them while you are not connected to Wifi/3G directly through Safari. This can be useful if you would like to read an online article later in the day where you know you will not have an active Wifi/3G connection. Using the tweak is easy! Simply press the action button in the Safari toolbar and choose the new option for “Save for Offline”. The webpage will now save and then you can view it from Bookmarks > Saved Pages. WebOffline is available through the BigBoss repo for free. With the QuickClear Cydia tweak you can easily clear notifications from the iOS 5 Notification Center. This is because the tweak changes the Clear Button in the iOS 5 Notification Center to only require one press as opposed to two. A very simple tweak that can make things a lot easier if this two-step process has been getting on your nerves. You can find the QuickClear tweak through the ModMyi repo for free. Do you miss the slide-to-zoom function, that was present in the iOS 4 Camera.app, after updating to the iOS 5 firmware? If you do, then you will be glad to know with the ZoomIsBack! 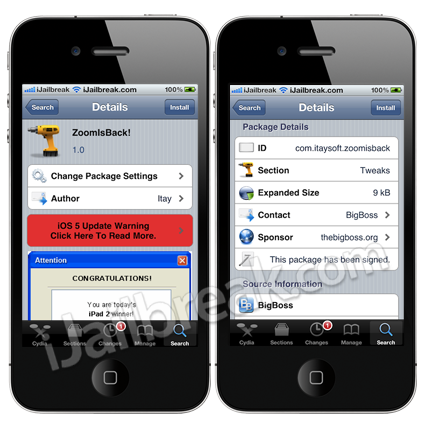 Cydia tweak you can bring back this functionality while running the iOS 5 firmware. After installing the tweak you must simply double tap the screen while in the Camera.app and the slide-to-zoom function will return. You can find the ZoomIsBack! tweak through the BigBoss repo for free. Let us know what you think of these jailbreak tweaks in the comments. i got the access code, but when i called from a different number which i dnt have in my contacts, it doesn’t not recognize the number!!!!!! No access code as yet.